As far as Christopher Columbus was concerned, during his four voyages across the Atlantic Ocean, he never discovered New World, but instead had reached some of the outer islands of Southeast Asia. However, another Italian explorer, Amerigo Vespucci, made a couple of trips across the Atlantic and published an account of his journeys. In 1507, a German cartographer, Martin Waldseemuller, produced a map based on those accounts. Waldseemuller believed that Vespucci, Columbus and others had not reached Asia but instead had found a new continent, a Terra Nova, which he called “America” after Vespucci’s first name. By the time Waldseemuller printed this updated 1525 edition, he had second thoughts about naming an entire continent after one man, and so the word “America” was removed. However, it was too late, and the name for the new continent had taken hold. 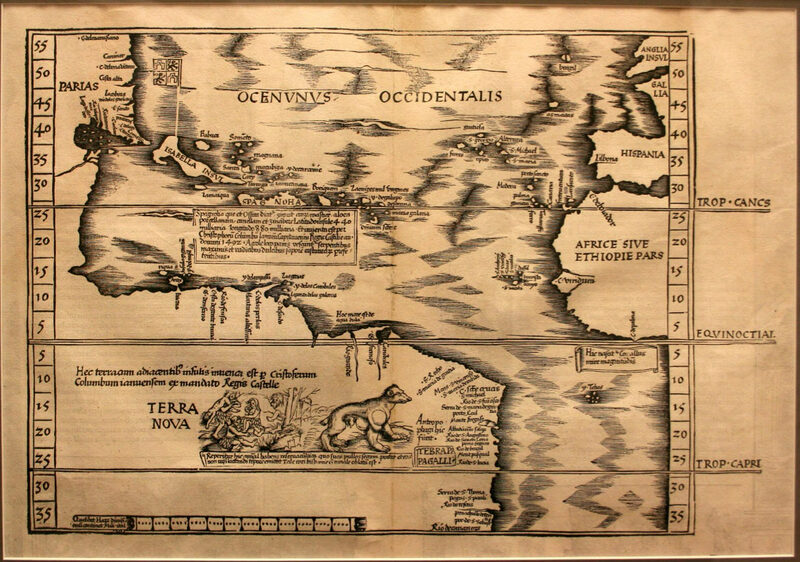 This map, printed by Waldseemuller from a woodcut, is one of the oldest maps in the collection at the Museum of the Big Bend.